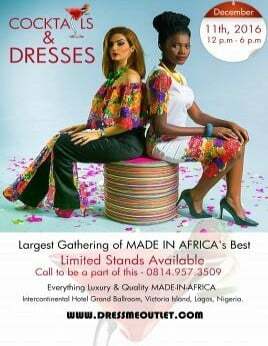 Cocktails & Dresses-Largest Gathering of Made-in-Africa’s Best is set for Sunday, December 11, 2016, themed “Season's Greetings: Everything Luxury & Quality Made-In-Africa”. It will be a full-day December Shopping Rave. The aim of the bi-annual Cocktails & Dresses is to strongly promote the very best of African designs and to greatly increase visibility to the fashion, retail and e-commerce industries in Africa. The upcoming December edition promises to be one of the best retail industry events in Africa with worthy strategic partnerships and special guests. For this end of the year edition, Dressmeoutlet.com will expand beyond borders even more with retailers from other countries already pledging dedicated interest in the event. We are calling on media partners, exhibitors, public relations & event partners, retail industry leaders and other interested groups to join us in combining strengths to ensure the success of the event.